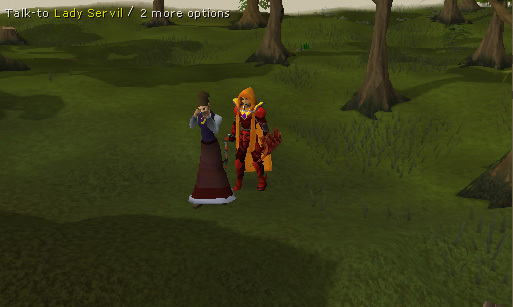 Speak to Lady Servil, found slightly northwest of the Fight Arena south of East Ardougne. She tells you that her broken cart isn't her only problem... her family is missing! Tell her that you can help, and she will tell you that her husband and son have been kidnapped by General Khazard. Make your way to the northeast-most house. 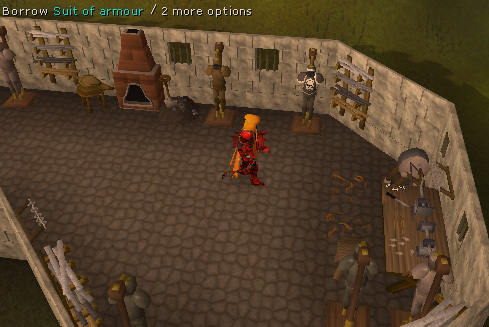 The Armour Stand in the northeastern corner of the house has a "borrow armour" option. 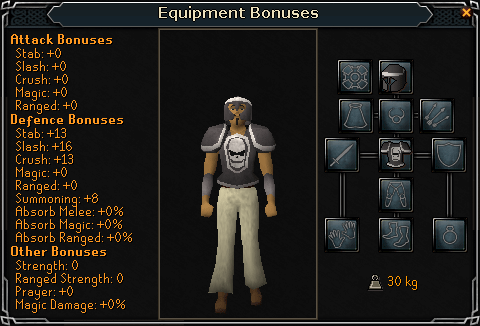 After taking the armour, you'll find it is a Khazard Helmet and Khazard Armour. 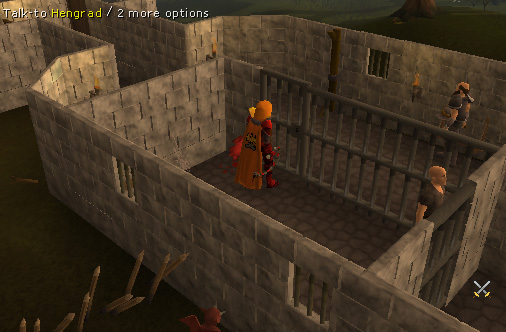 Equip the Khazard Armour and go south of the house to the prison. 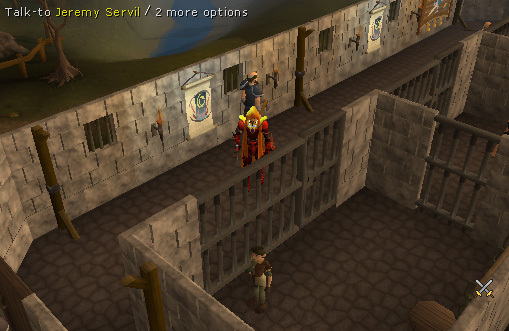 Talk to Jeremy Servil, located in the first cell, and he will tell you that the guard has the keys to the prison. Go south through the narrow hallway to the room in the southeast corner. The guard here obviously likes his beer! While talking to him he will tell you that Khali Brew makes him sleepy. 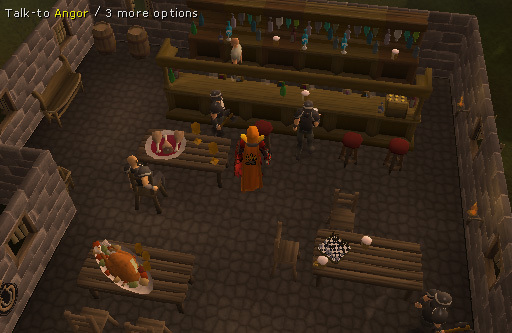 Go to the Tavern west of the Fight Arena and speak to the Barman to buy a Khali Brew. Note: You will also find lots of drunk people in the tavern! Bring this to the guard in the prison who promptly imbibes and becomes rather drunk. He is now happy to give you the keys. 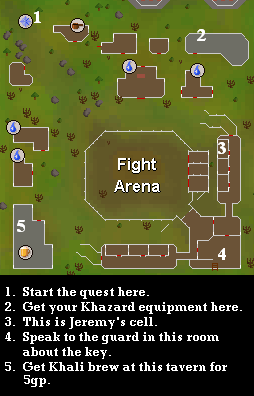 Before you head back to Jeremy's cell, make sure that you have anything you feel you need to fight all the monsters in this quest because you will not get another opportunity. 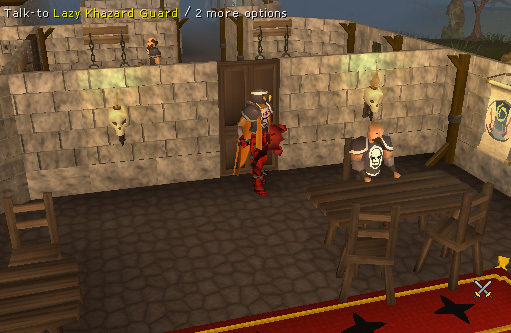 The nearest banks are in East Ardougne and Yanille if you need to retrieve anything. Head back to Jeremy and use the keys with the prison door to open it. 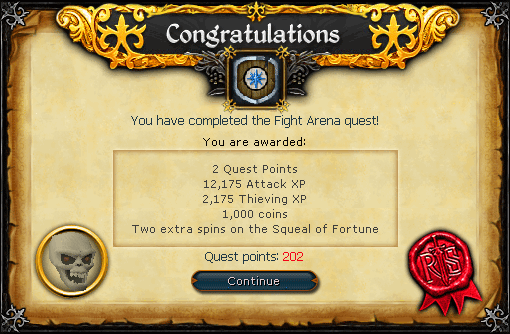 A small cinematic occurs and you find yourself in the Fight Arena. Jimmy says that you need to save his father, Justin, from the level 63 Ogre. After defeating the ogre, a conversation with General Khazard ensues, in which he says if you defeat him he will let the family go. You'll then be taken to your cell in the prison. Talk to your cellmate, Hengrad, and, after a short conversation you will find yourself escorted by guards into the arena again. Defeat the level 44 Scorpion, and then the level 77 Bouncer. 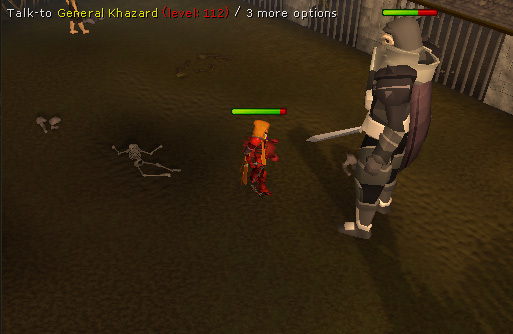 Once you defeat them, you'll go up against General Khazard himself, who is level 112. You can defeat him but it is not necessary in order to complete the quest. If you find yourself low on supplies or are feeling daunted by his skeletal presence you can run from the fight. You may use any fighting method you prefer to fight the Scorpion and the Bouncer. There is a safe spot to range/mage behind the large skeleton, for instance. It may not work for the last fight though. 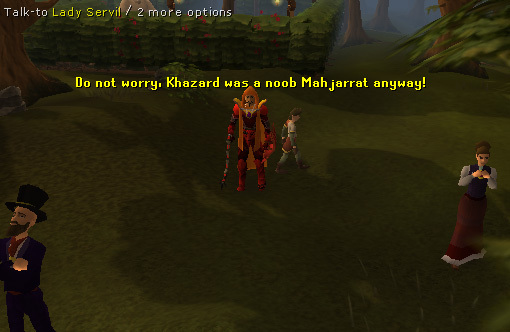 General Khazard won't follow you around, like the other enemies do, as you fight. 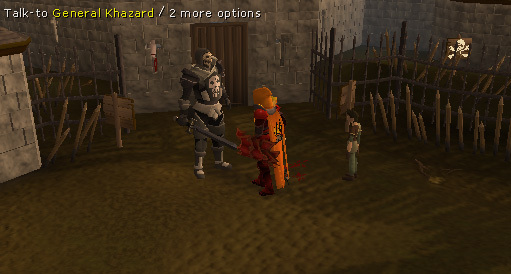 If you try to range General Khazard from that spot, he may just walk around it or leave. It is also important to know that once you kill him you have to fight him again in giant form. In either case, whether you have killed him or not, by whatever means, head back to Lady Servil and claim your reward.